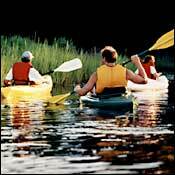 Explore the island’s scenic inlets by kayak. If you long to be on the water but not necessarily in it, kayaking may be the sport for you, and the shallow inlets of Shelter Island are the perfect place to find out. Jay Damuck of Shelter Island Kayak Tours leads two trips a day (9:30 a.m. and 5:30 p.m.) for both novices and vets. Don’t worry if you’re the former. “Eighty-five percent of the people I take out have never been in a kayak before,” he says, “but I’ve never run into anyone who has a problem with it.” Typically, Damuck takes his charges along the eastern shore of the island, through the Mashomack Nature Preserve, taking care to point out wildlife—great white and blue herons, tern, egrets—as he goes. Taylor’s Island, a tiny spit of land with a turn-of-the-century log cabin, is a popular pit stop for a picnic lunch; the massive boulders sculpted by ancient melting glaciers off Foxon Point are also crowd-pleasers. Off the water, try the crab cakes at Planet Bliss or the beef ribs at Commander Cody’s, then crash at the Olde Country Inn in the Heights, a Victorian bed-and-breakfast that dates to 1886. Shelter Island Kayak Tours are $45 a person, $22.50 for kids 12 and under (631-749-1990; kayaksi.com); Planet Bliss (631-749-0053); Commander Cody’s (631-749-1851); Olde Country Inn ($175–$255; 631-749-1633; oldecountryinn.com).  Shelter Island Online - Check this out for restaurants, shopping, and entertainment guides.  Shelter Island Reporter - Local newspaper of current events.